Long Beach Homicide Detective Todd Johnson wrongly concluded that Dana accidentally fell down while doing yoga at home on the morning of March 3, 2014, hit the back of her head on a flat, smooth, concrete floor, and died. Some people say, yes, these accidents happen: she bumped her head, and everything seemed fine for a while, but she died later from a brain injury, as in the case of actor Natasha Richardson. In this case, however, the victim’s injuries were far more extensive and severe than a bump on the head, or even a serious concussion. According to the autopsy report (pdf), Dana’s occipital scalp was split by an irregular laceration measuring one-and-three-quarter inches long. Her occipital bone (the thickest bone in the skull) was broken, with a fracture measuring four-and-one-half inches long. As documented by the medical examiner, Dana’s brain injuries included acute subdural hematoma, subarachnoid hemorrhage (thick and severe), brain contusions, intracerebral hemorrhage, intraventricular hemorrhage, and transtentorial herniation. LBPD homicide detectives took photos of the back of Dana’s head in the hospital on March 4, 2014. At that time, more than 24 hours after it was inflicted, the deep wound continued to ooze blood. Clearly, this was not a minor injury that had somehow worsened in the hospital, leading to a freak death. This was a massive, mortal wound. 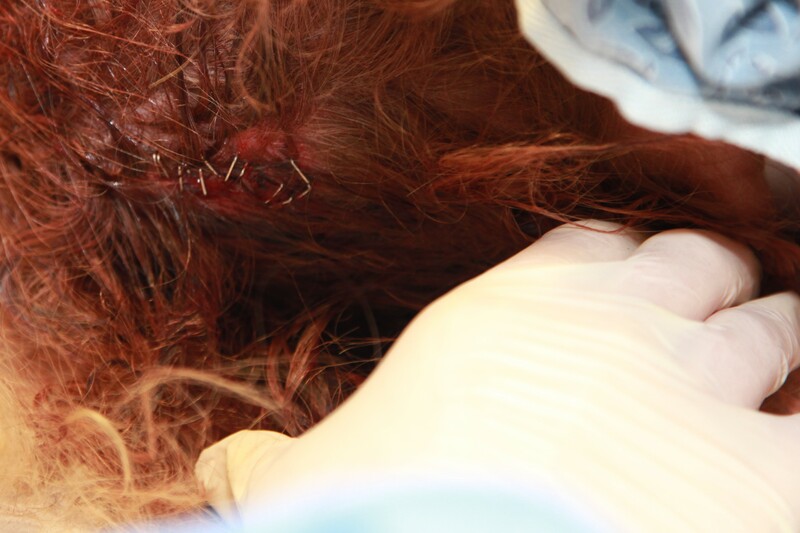 Detail of scalp laceration from LBPD photo img_00150 taken March 4, 2014. Blog: What can we learn about this case from watching people fall?